“This is a photo of Auntie when she was in her barn home. 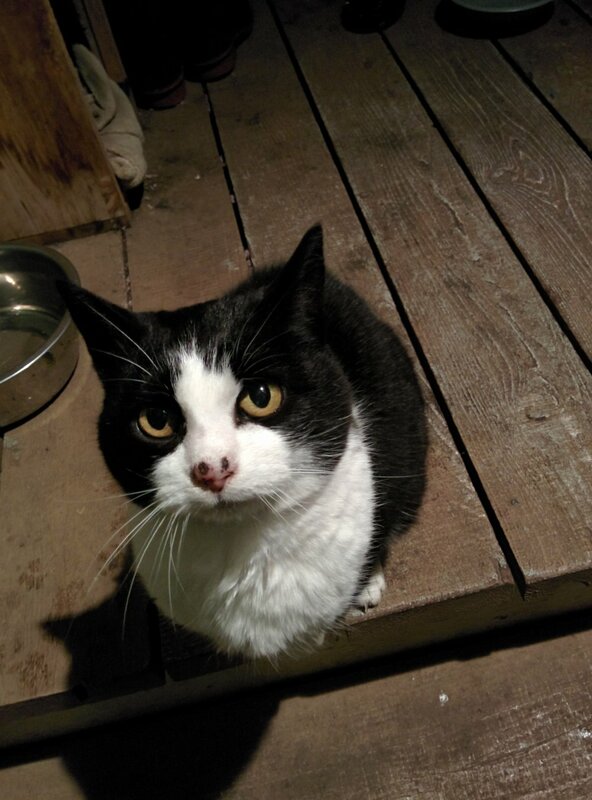 She developed cancer on her nose so was brought to us for treatment and an indoors home. She seems healthy other than for - most likely - parasites. She had an exam and blood tests. She had a thorough brushing after many years of the outdoor life. She is looking good . Her teeth are good so she is considered to be 10 or under. When living in the outdoors and barn she was friendly with people, so we shall see how she adjusts to indoors life and then update this post. She looks like a very sweet girl. January 2019 update. Cowboy is now being treated for pancreatitis. He is doing well with his treatment and we will post an update as time goes by. Cowboy is an adult male who lost his home when a baby was about to arrive. He had become feisty and bit the dad and it seemed too risky to the couple to keep him so they had to make the tough decision to surrender. Cowboy does not do well with other male cats so he was not a good candidate for the SPCA. Cowboy is a gorgeous polydactyl kitty and has 7 toes on his big front feet which look like huge mittens. He is not fond of people and likes only minimal interaction. If treats are involved he can be petted for a few seconds at most. He is very expressive and when a nap is interrupted he can look like Grumpy Cat. Cowboy is healthy and has no medical issues. It would be good if he got a bit of exercise as he is a teensy bit chubby. He is a quiet cat who likes to nap a lot. Cowboy needs a home with great patience since much trust-building is needed and he will always be an independent type. He is available for a foster or adoptive home, but we would require that the potential adopter come to visit him several times first to get to know him and be sure they are able to deal with this type of cat. He is capable of biting so can only be around mature adults who understand that he needs to be given space. We must keep in mind he was surrendered due to being capable of striking out and not considered safe to be around children. He would be best as an only-cat or with one female cat as he seems to get along with non dominant females who he ignores but at least has no problem with them. He needs a 100% indoors home with no assess to the outside as he would be an escape risk. He is a great cat for someone who loves cats but does not need a cuddly cat. He is an interesting fellow who is happy with lots of quality alone time. He would be a great "roommate" for someone who is gone to work during the day. Over time he could be a great companion for the right person. Mindy is white with lovely gray markings and has a one-of-a-kind appearance. The gray areas almost look like the design of a coat and hat. She is friendly, but a loner. She socializes a little bit at breakfast and then retreats for quality alone time during the day. When Mindy is very comfortable with someone, she will sit in their lap. Mindy is quite affectionate, purrs loudly, and likes to roll around on the carpet and be petted and snuggled – once she gets used to someone which can take a couple months. She is timid around other cats and is easily frightened by dominant cats. Mindy is very sweet and content to nap all day and wait for someone who is gone all day, but loves to come up to them later and meow to ask for attention. Mindy is clean cat and healthy cat. She would be a good companion and nice cat to come home to. When comfy she will sleep on the foot of the bed or near the bed. Mindy particularly likes women and in her past foster home she sometimes left the room when the husband entered. We don’t know why she is afraid of men, but she may do best in a home with only a woman. Here is why Mindy is in this Cats in Care section: Mindy has a behavior problem where she will pee over the end of the box and occasionally has peed on other items. If there are other cats in her area she will also occasionally pee on other things to mark her territory. If she were with one quiet woman and no other cats, perhaps this would not happen as she has had long periods of not doing this – but it would be a trial foster or adoption. Mindy has become overweight this year due to being with other cats and the type of feeding required for that situation. She would do well in a situation where the amount of her food could be controlled. Once settled and comfortable, Mindy would be a wonderful companion. Mindy no longer has a “sponsor” but is very comfortable and enjoys her life here. However, her litter box issue has worsened and she requires a lot of special care and bedding changes. She has also had some issues with diarrhea but is stable now with treatment. Mindy is doing about the same. She is a healthy kitty but still has her litter box issue. She enjoys the company of her roommate Mrs. Spice and also likes petting. Mindy has a sponsor who donates for her food..
Mindy still has a litter box issue and will occasionally pee in her cat bed, etc. ... However, she is extremely affectionate and loves petting. She has gained weight and is on a diet now. For Mindy, this is her home and we are able to accommodate her needs at the rescue. Mindy does pee in the litter box a great deal of the time now, but not 100%. She remains unadoptable but has her friends here, feline and human, and is content. Mindy is getting along well with the other cats here. She has continued to have her litter box problem but would be happy to have a home of her own someday if someone is willing to deal with her issues. I’m called Sooty and don’t mind the name as I prefer it to the old standbys of Shadow or Blackie or the ever-popular Midnight. I’m a black fluffy cat and we are known for our sweet personalities. I’m a little chubby because I need a nice indoors home with people who will play with me so I can get more exercise. As with all us guys here at the “feline hotel”, I prefer not to cry to you about my troubles before rescue but we were all “down on our luck”, to say the very least, before making our way here. One day I found myself homeless and without any food and it was very frightening. I am not one to beg at doors or rummage through garbage cans as, after all, I come from a long line of royalty (but, unfortunately, was mixed up at birth with an ally cat – or at least that’s my story). Anyway, I found an okay place to sleep with one serious drawback – no room service! I could see a nice feral feeding station across the very wide street. Having nine good lives ahead, I decided it was worth it to risk just one and make a run for it. Since I am here to write this bio, you can see that I still have nine lives left. However, the nice woman feeding gourmet meals at the station disagreed with me about whether there was actually a factual basis for the “nine lives myth” as she called it. She then cleverly tricked me into coming with her. I’m now inside and glad I am. No more cold rainy weather and also, believe me, the snow looks much better through a window than on my fur. I had a wispy tail from those days out in the elements and it has improved greatly – although it might not yet be luxurious as it was before my homeless period. I brag to the other male cats here about how much I miss the excitement of the gamble I took running across that busy street, but we are all really happy to have a safe comfy home every day no matter what the weather. I didn’t trust people for awhile after rescue – I had been on my own in survival mode for quite a while. Now I see there are huge benefits as I LOVE having my back scratched just in front of the tail. I’m laid back and get along with other cats and especially like the mellow ones. I mostly ignore the bossy ones and they even seem to like me. Sometimes I let them all curl up with me if it’s a cold night, but I’m most comfortable going off to my sunny window for a nap during the day. I’m friendly but not “needy”. Sooty continues to have little cysts that need surgical removal once or twice a year. He is very comfortable here and we stay on top of his vet needs. Sooty has a sponsor who supports his monthly food needs. Sooty is good friends with the other cats. He is pretty good with people but is hard to handle or get into a carrier unless he knows someone very well. He recently had many small cysts removed. They were not malignant but we do not know yet if they will recur. Sooty had a recent back injury but has healed nicely. However, we don’t want to rush him. He is on a special diet to try to lose weight. It was most likely his weight that contributed to his fall. He is very bonded with the other cats here. We are going to delay seeking an adoptive home until his weight is reduced. Copyright Helping Homeless Cats © 2018. All rights reserved.